I’m one of those people who just never win anything–not even my $1 back on the occasional lottery ticket. One time, long ago, I did win a door prize at a nursery school silent auction fundraiser: for free pole dancing classes. The gift certificate ended up in the trash because none of my friends would touch it, either. That’s the type of luck I’ve had, until last month. Last month, I was one of 11 people selected by Mango Health to receive the wish I had entered in their Mango Wish contest. My wish was for a CSA (Community Supported Agriculture) farm membership at Angelic Organics. Mango Health is a free app that I use to remind me when and how much to take of my vitamins and prescription meds. If you take several meds or vitamins/supplements at different times a day or on different days a week app, this the app for you! You can find a link to the app here. I also agreed to guest blog about my CSA experience. Here’s a link to my guest blog at Mango Health. More than a decade ago, I banned trans-fatty acids from my kitchen. From that one small step, I have taken other steps in an attempt to eat as nutritiously as we can afford. For a family of five, including two hungry teenage boys, buying fresh all-organic produce rapidly surpasses the grocery budget. And as you know, my little container garden, while pretty and fun, can’t make a dent in our vegetable consumption. Except for zucchini–anyone want any zucchini? One way to buy organic for less is to purchase a share in a CSA (Community Supported Agriculture) farm. In a CSA, a local farmer opens a number of shares (also called memberships or subscriptions) for upfront purchase by the public for a set number of weeks (usually 20 to 24, running May through November). 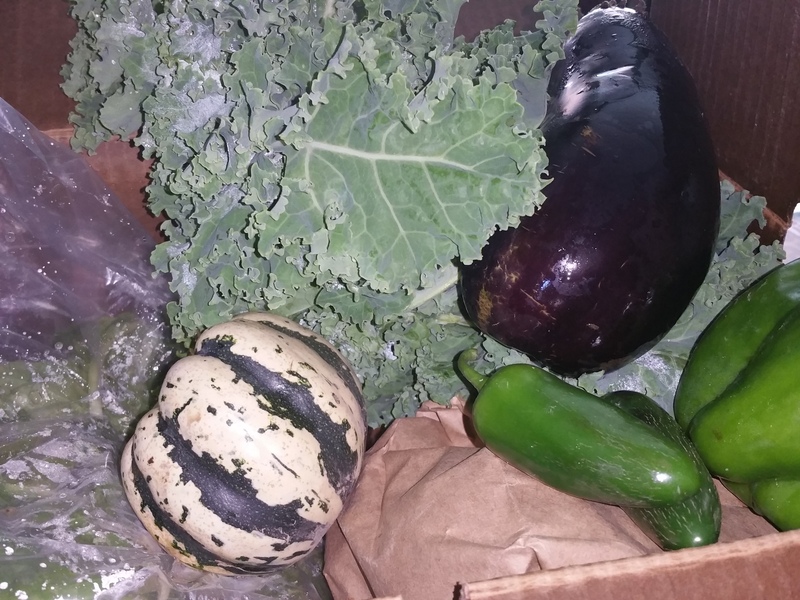 Each week, members pick up a box of mixed seasonal produce from a nearby location, usually a volunteer’s garage. The upfront investment has been my barrier to a CSA subscription. When the cost is averaged out over 12, 20, or 24 weeks, it is significantly less than buying those organic vegetables at a grocery. However, it’s been difficult saving that lump sum and justifying it without ever having tried it. 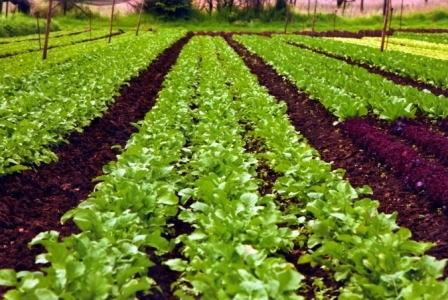 The upfront investment supports the farmer’s cash flow, and the farm works to provide a full box of produce each week. Members incur shared risk with the farmer. If the growing season isn’t productive, members are not reimbursed. The rewards, though, are greater than the risk: fresh-from-the-ground organic produce packed with nutrients; the challenge to cook seasonally; increased support for small local farmers; and, opportunities to visit and volunteer on the farm. Depending on the farm, CSAs may offer different types of shares, such as produce, fruit, or meat. On Sept. 2, I picked up my first 12-week Late Harvest box from Angelic Organics, my local CSA of choice. I couldn’t wait to open my box when I got home and see what was in it. I felt like a kid on Christmas morning! First produce box from my CSA. My box contained plenty of produce for a family of five: an acorn squash; dill; a green cabbage; a huge yellow onion; a green pepper; a head of broccoli; a 5-lb. bag of Yukon Gold potatoes; a large heirloom tomato; a 3-lb bag of small slicing tomatoes and cherry tomatoes; heads of romaine and red leaf lettuce; and, a bag of pea shoots. The pea shoots were a new to me. At first glance, I thought I had received a big bag of baby spinach. When I cleaned the veggies, I realized that this tangle of vines was definitely not spinach. Luckily, the farm newsletter pictured a worker harvesting pea shoots. I made a snack of yellow tomato, pea shoots, a little onion, parmesan, and balsamic vinegar. The shoots are slightly sweet and taste like snap peas. Yum! This week, my box again included a green pepper, a large heirloom tomato, a larger bag of medium tomatoes, and another 5-lb bag of potatoes. It also included a large bunch of basil, an eggplant, a large bunch of curly kale, several large jalapenos, and a large bag of chard. A clear sign that autumn is here: the box also included a little sweet dumpling squash and a cooking pumpkin! The Angelic Organics produce has been part of all of our home-cooked meals for more than a week, from main course salads, stir fries, and sides to my lunches and a delicious potato salad on Labor Day. The taste of each vegetable and green is sharper and more pronounced than any supermarket vegetable. I’m so excited to be cooking with pretty much exclusively organic produce–as well as cooking seasonally and supporting local farmers. Be sure to check out my Ratatouille recipe, which is perfect for an early autumn dinner, whether here in Chicago or in Provence! Here is the recipe for Broccoli, Tomato, Onion & Chicken Stir-Fry, which I included in my Mango Health guest blog.